Welcome to Le Reve Bridal, voted 'Loudoun County's Premier Bridal Experience" and one of the highest rated bridal stores in Virginia!. We offer a carefully selected line of elegant, yet affordable Wedding Gowns from top names and exclusive vendors you won't find anywhere else in the area. To schedule your no-cost, no-obligation appointment today, please call us at (703) 777-3757 or email us. Check Out ABC News Special Report to learn more. 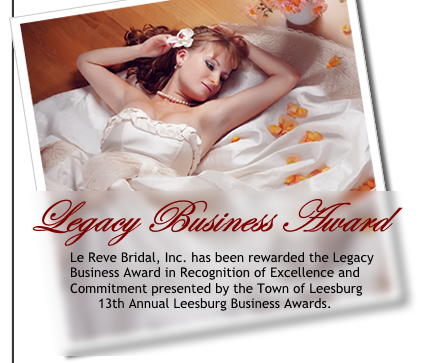 Copyright © 2012 Le Reve Bridal, Inc. All Rights Reserved.